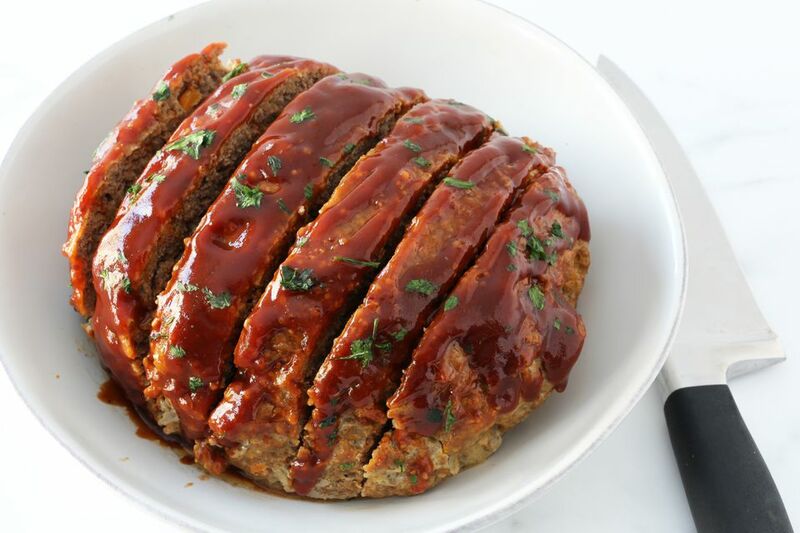 This Instant Pot meatloaf is full of nutritious ingredients. The vegetables—onions, carrots, and celery—are finely chopped or processed and added to the meat mixture, making it an excellent way to get vegetables into picky eaters come mealtime. If there is a vegetable you don't care for, feel free to change it or add more of another. The meatloaf holds together nicely as well and makes fabulous sandwiches. The Instant Pot pressure cooker cooks a meatloaf in a fraction of the time it would take in the oven, which frees up the oven for other dishes. While the meatloaf cooks in the Instant Pot, you can bake potatoes, a casserole, or a dessert in the oven. If you like lots of sauce, feel free to double the topping ingredients. Or skip the topping and drizzle on ketchup or your favorite barbecue sauce. Remove the ground beef from its packaging and pat dry with paper towels. Chop the onion, celery, and carrot in a food processor, or mince them finely. In a large bowl, combine the ground beef, onion, celery, carrot, breadcrumbs, ketchup, milk, eggs, kosher salt, pepper, and 1/2 teaspoon of Worcestershire sauce. Using your hands, mix the ingredients until thoroughly blended. Shape the meat mixture into a round or oblong loaf and place it in a 7-inch baking pan or on a sheet of heavy-duty foil. Add 1 1/4 cups of water to the Instant Pot. Place the meatloaf in a sling or on the Instant Pot steamer rack or trivet, and lower it into the pot. Lock the lid in place and ensure the steam release valve is in the sealing position. Choose the pressure cook or manual button, high pressure, and set the time to 40 minutes. When the time is up, let the pressure release naturally for 15 minutes. Carefully turn the steam release valve to the venting position to release the remaining pressure. To protect your hand from any remaining steam, use the handle of a wooden spoon or another utensil to turn the valve. Meanwhile, in a saucepan, combine the 2/3 cup of ketchup, the brown sugar, mustard, and a dash of Worcestershire sauce. Bring the sauce mixture to a simmer just before the meatloaf is ready. Remove the meatloaf from the Instant Pot. Carefully drain excess liquids from the pan or foil. Move the loaf to a plate or platter and drizzle it with the sauce. Serve meatloaf with boiled or mashed potatoes, or serve it with hot cooked rice. Refrigerate leftover meatloaf. Slice it thinly to make grilled sandwiches with or without cheese, or add it to a pot of chili, a quiche, or hash.